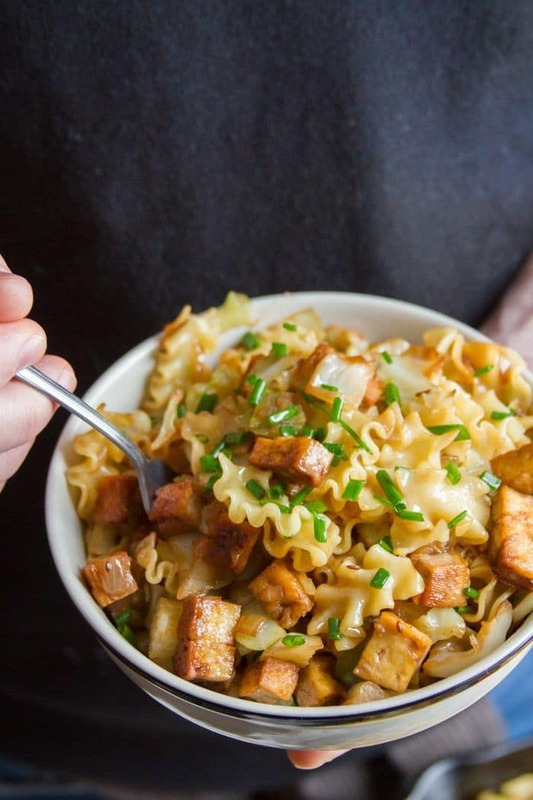 Cabbage and onions are stir-fried with noodles, sauerkraut, and smoky tofu to make this comforting and delicious vegan haluski. If people had any idea of the breakdown of recipes I spend my time perusing on the internet, they’d all think I ate nothing but meat. Shouldn’t I be all about the vegan recipes? Well yeah, but that’s not where I get my inspiration. I’m secretly all over non-vegan Pinterest and Facebook checking out what people are making and figuring out how to make it vegan. Oh, and when I come across a totally new-to-me dish that I’ve yet to veganize? That’s the best! So I was scoping out recipe videos on Facebook a while back when I came across haluski. It was super simple, but looked like total comfort food and I could see that the Facebookers were into it. So I put vegan haluski on my list. 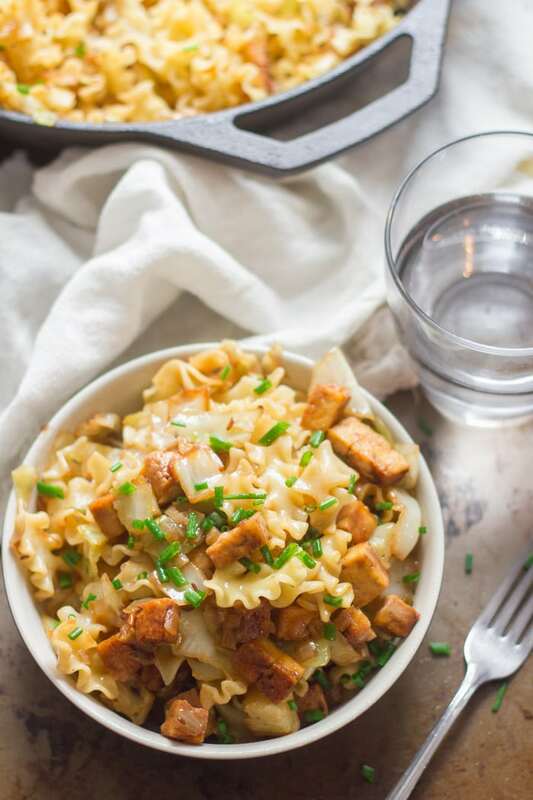 There are a bunch of ways to make this dish, but the most basic version involves not much more than onions, butter, egg noodles and cabbage. 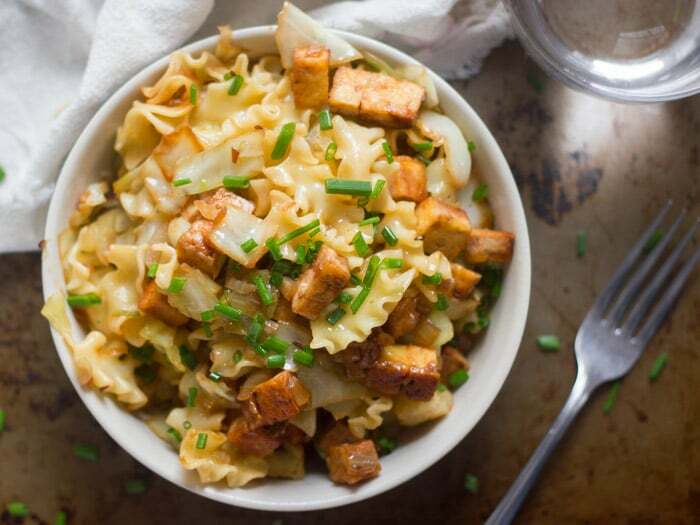 That’s pretty easy to veganize by swapping out vegan butter for the dairy-based stuff and regular pasta for egg noodles. You can really use any shape pasta you like, but I had an epiphany in the supermarket and realized mafalda (those mini lasagna noodles) pretty closely resembled egg noodles, with their wavy shapes and all. Some versions of haluski also include bacon or ham. I like to go for maximum deliciousness and I’m always looking for an excuse to cook up some smoky tofu, so I did just that. I went with the quick and dirty technique used in my recent fajita recipe and simply pan-fried the tofu before dousing it with sauce. That worked out great because some of the smoky flavor from the sauce ends up in the skillet, and in turn in your noodles. So good! I realized after I photographed the dish that sauerkraut was an option. Any time sauerkraut is an option I take it! So I threw some into the skillet at the end, and it was pure heaven. You can use just about any pasta shape with this recipe. I selected mafalda because it looks like egg noodles. If you can’t find mafalda, farfalle and rotini would work well too! Want to make this recipe gluten-free? Use your favorite gluten-free pasta and gluten-free tamari in place of soy sauce. What’s vegan butter? Is it the same thing as margarine? It’s basically margarine, but not all margarine is dairy-free — vegan butter is. Earth Balance and Melt are two popular brands to look for. What if I can’t find vegan butter or just don’t want to use it? Substitute your favorite cooking oil. Wait, I thought haluski was made with dumplings/potatoes/something else other than pasta? There are a bunch of different regional versions of haluski, and egg noodle haluski is just one of them! Would you like me to create another version as well? Let me know! Bring a large pot of salted water to a boil and add the pasta. Cook according to the package directions, then drain the pasta into a colander. Stir the soy sauce, maple syrup, liquid smoke, and vinegar together in a small bowl. Coat a large skillet with 1 tablespoon of vegan butter and place it over medium heat. When the butter is hot and melted, add the tofu in an even layer. Allow it to cook for about 10 minutes, flipping once or twice until browned on multiple sides. Pour the soy sauce mixture over the tofu and cook until most of the liquid has dried up, about 1-2 minutes longer. Remove the tofu from the skillet and transfer it to a plate. Add the remaining butter to the skillet. Once the butter is hot and melted add the onion and cabbage. Sauté for about 10 minutes, until tender (or until the cabbage is as tender as you like it). Add the garlic and cook for 1 minute more, until very fragrant. 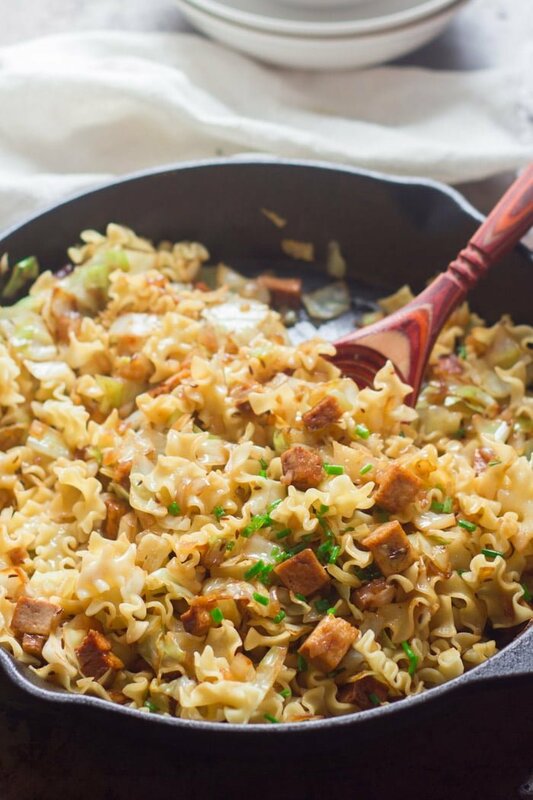 Add the noodles, tofu, caraway (if using), and sauerkraut (if using) to the skillet. Cook 2-3 minutes more, until heated throughout. Divide the haluski onto plates and top with parsley and chives. Serve. I am so excited to find this recipe! My aunt has made this dish for my uncle who is Slovak. It is (or sadly,) was one of my favorites from her kitchen. She will be as thrilled as me to discover the magic you have created with the tofu. You are right, it is total comfort food. I’m so glad to hear that! I hope you both enjoy it!! This was delicious, as has every one of your recipes I’ve tried. Not a fan of tofu in general, but this was great. I’m so happy to hear that! :) Thanks Elizabeth! 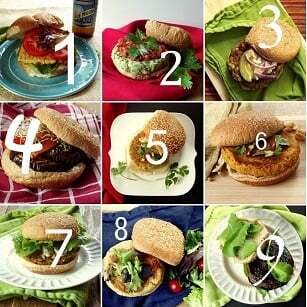 This looks delicious and I am going to make it tomorrow. Just wondering if I can use coldslaw for the cabbage? I just happen to have a lot of it on hand. Just made this and it is delicious. My anti vegan husband couldn’t stop eating it. Keep up the good work. Yay!! Glad you both enjoyed it! Thank Ilene! That’s so awesome to hear! I’m glad you both enjoyed it! Thanks Erin!! Is this recipe freeze-able? I would like to make a double batch and put some in the freezer for later on in the month. I think so, but I can’t say for sure because I haven’t tried it! I’d just say seal it up tight, and I’d love to hear how it works out if you try it! This has become a staple recipe in my house. 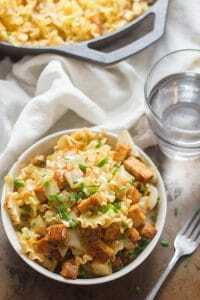 It is easy “vegan on a budget” food that my son absolutely adores. He always tells me to make extra so that he can have the leftovers for lunch the next day. That’s awesome!! I’m so glad you’re enjoying it! Thanks Reggie! What a fantastic dish. I had no sauerkraut on hand but kimchi was a fine substitute. I’ll be making this regularly. Oh yum!! I love kimchi and I bet that was delicious! Just got done making this for supper. Delicious. Hi. I just wanted to say, this is amazing, transforming recipes and all. The original halušky are made out of potatoes, sort of like gnochi, it is not pasta.